Paul visited us this Saturday and picked up his italian ice cart and lots of Little Jimmy’s Italian Ice and was on his way. 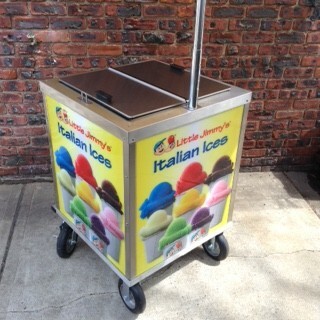 He was going to start up his push cart business with his kids and was already scheduled for several events already in Maryland- Give us a call to get yourself started – 800 763 4348 and ask for anyone here – Little Jimmy’s Italian ices we’re an all family business. 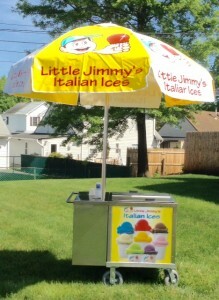 What makes a Little Jimmy’s Italian Ice Cart Special? Besides holding four cans of our delicious Italian Ice all day long, they also talk. Our pushcarts tell stories of entrepreneurs selling Italian Ice and having fun. Here’s the story of Ross and his pushcart from 4th of July last summer. You can see more stories by clicking here. I was searching around YouTube the other night and found a bunch of videos that some of our customers had uploaded that I had never seen before. I thought I would put them up on our blog so you could take a look at these YouTube Videos also. 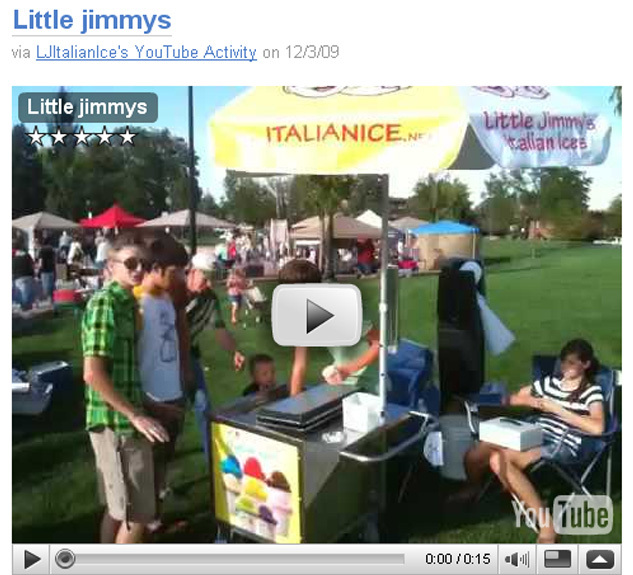 Little Jimmy’s Italian Ice is a fun and easy business that nearly anyone can do. If you have not done so yet, sign up here to get more information on our Italian ices and pushcarts. Click here to check out these videos. A push cart is also perfect way to start a new business. Buy four Italian ice push carts or more and have a fleet that you can place daily at parks, sports fields, flea markets, beaches, concession stands, etc. ; you know where the spot is, IT’S WHERE THE PEOPLE ARE! And of course we would love to share more information with you even if you are only interested in one pushcart too. We will show you how for a minimum investment. Whatever money you spend will go towards your product or your equipment! There are no royalties or advertisement fees or any other ridiculous fees. JUST PROFITS! We are not into franchising, just selling you Italian Ice Pushcarts and Italian Ices. 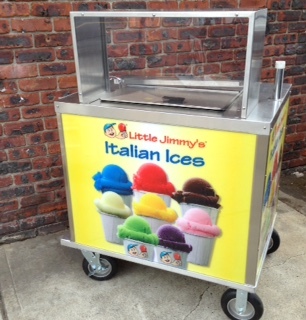 Call us at (800) 763-4348 for more information on our Italian ice pushcart program.